Like all screening machines designed for the running on static principles, these sizers have a high capacity compared to their dimensions. They are suitable for the selection of particularly damp and sticky materials with a good screening accuracy and a high efficiency, up to a maximum feed size of 600 mm and selection to 30 mm. Furthermore these results may be reached even with cuts lower than 20 mm and medium-coarse feed sizes. The machines are rugged in construction and suitable for the heavy work which they are required for. The linear vibration of the screen is generated by counterrotating eccentric weights motors. 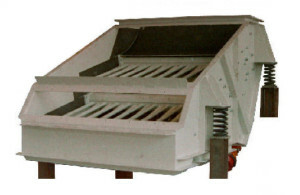 surface of these sizers is much more higher; therefore the possibility of clogging for the bars is very low, even with sticky materials or materials difficult to be screened. On planning the sizer, we considered (in details) the accessibility and the overhaul of wear parts (bars and protection plates) and the quick replacement of same. According to the operation characteristics and the non-clogging, we can supply our machines in both open and closed execution; the closed execution can be supplied with a vibrating or static cover.